It's Day 15 of the So Damn Domestic Clutter Free Countdown, which means time to declutter 16 items. I had to confirm the numbers a few times, like, "Wait, is it Day 16 or 16 items?" I don't need to make a list for my items today. 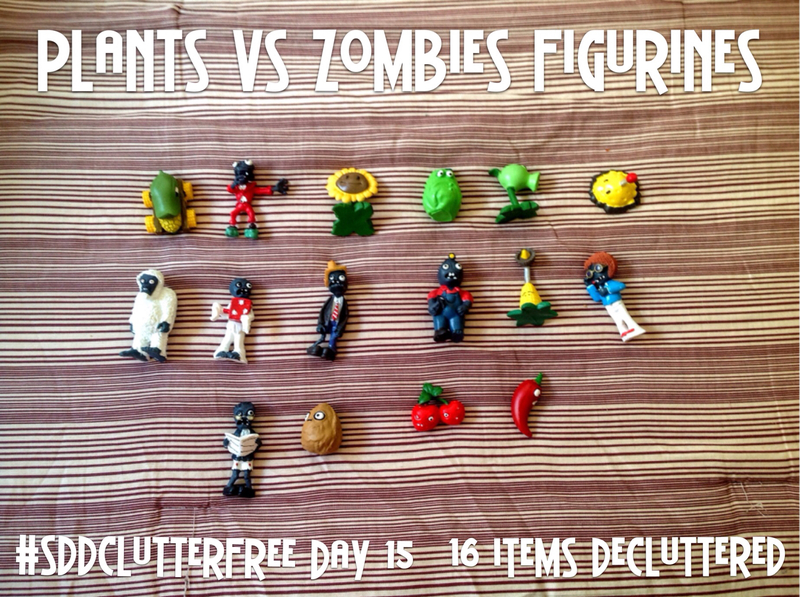 I chose to get rid of my Plants Versus Zombies figurines. There's exactly sixteen of them, so it's perfect. I bought them online, and when I opened the packaging, they smelled horrible, a strong, chemical oder. I didn't return them because I ordered them right before I moved to bring to CA as a gift for my cousin. There's too much going on when moving to deal with shipping a return. I didn't want to be responsible for my little cousin's lead poisoning, so I held on to them. I'm not sure if I should sell them with a disclaimer, and let a buyer use their own disgression, or just throw them away. Speaking of things I'm not sure of, I've been using this great app called Todoist, but I'm still getting in the groove with it. I love that it makes my to-do list an active part of my day, instead of a "someday I should get to this" list. I can assign different tasks to different days, set recurring deadlines, and compete with myself and how many tasks I'd completed the day before. I used it to pace my reading for book club. I did the math of how many pages I'd need to read per day to finish the book the day before book club. Then I set the task as "Read 15 pages Their Eyes Were Watching God every night at 11 PM." Sure enough, I finished the book right on time, and even had extra time to study the author's history and symbolism in the book. The main issue I've encountered is if I skip a day of a recurring task, it marks it as past due. I'd rather it just reset the task to let me try again. It needs an, "I'm not doing this. Leave me alone" option. It'd be great if I were a master of discipline and never ever deviated from my plans. But then, no it wouldn't. I like having flexibility built into my schedule. I like being able to rest when I'm tired or do more when I have a burst of energy. I've been using Todoist for a couple weeks, and I'd typed in my routines as individual items. Today I erased all of them. I replaced the fourteen Morning Routine tasks with one task called Morning Routine. It had started to overwhelm be that I had sixty-four tasks on my list every day. Now it's much neater. I changed my Kharma settings from a goal of 40 tasks per day, to a goal of 10 tasks per day. That means my tasks are weighted about the same as they were, so I'll still rake in lots of points. Yeah, there's points! Your status upgrades at different levels of points. It's pretty great. I only completed my massive night routine once this week, so I decided to take Flylady's suggestion to build a routine up from 3 tasks at a time. I was able to build my full morning routine as whole by taking notes along the way, but my dream night routine is about 2-3 hours long, so I think starting small is the way to go here. 1. Fill up the dish drying rack. I like this because it's very visual and finite. It's better than "Do all the dishes," which can overwhelm me. I have a feeling all the dishes will be done with this goal, anyway. 2. Read pre-planned number of pages. Right now I'm reading Wonder by R.J. Palacio, 50 pages a night, because it's a children's book. 3. Meditate. I'm using the Stop, Breathe, Think app. I like that it tracks my mental and physical settledness, as well as my emotions. It helps me notice patterns in my mood. Plus the meditations actually help me and there are stickers! It hurts a little bit to let go of the rest of my routine for now. It brought be so much peace of mind when I was able to complete it, but if it's not working, I gotta reset. Anyway, it's not gone for good. It's just on hiatus. Once I feel solid in those three things, I'll add in another three things. Looks like today I decluttered 16 toys, plus my to-do list, and my expectations. I like that perspective!